Home » Tarot, Readings & Analysis, Current News	» (TarotSeek) What will happen on 11-11-11 ~ November 11, 2011 ~ 11.11.11. ~ Eleven, Eleven, Eleven? 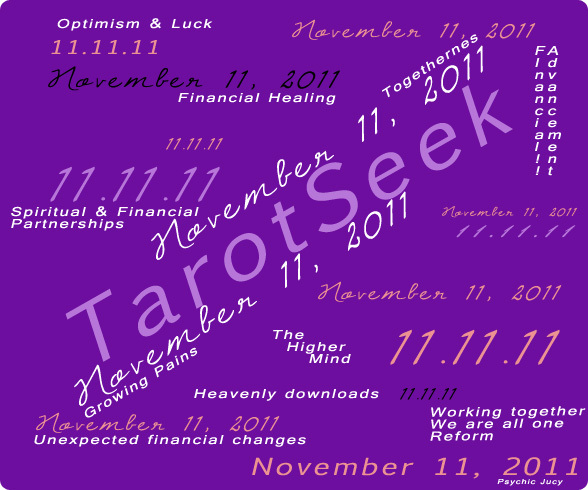 (TarotSeek) What will happen on 11-11-11 ~ November 11, 2011 ~ 11.11.11. ~ Eleven, Eleven, Eleven? Overall significance for November 11, 2011 (The World card) is the blending of the spiritual and material worlds. A spiritual portal opens up to the material world, to the world (signified by Saturn). Question: I asked what will happen to the Dow Jones on Friday? Response: [Worked with the Bright Ideas Tarot for this session, card picture not included] First thing I saw was a lot of angry people. Then I saw security trying to calm people down. Some people look depressed, others dissatisfied yet contemplative on what to do next, yet mostly people were angry. I see a mob walking out on the street. Advice, Action, or Suggestion: Will take a look at the Dow tomorrow. Maybe it takes a hard hit and then gets artificially saved — reminiscent of the Depression era. Update: The Dow Jones went UP! 2.5% globally, 2.9% US, 2.06% Europe! I really like asking specific and direct questions. General questions get general responses and then I got to figure out what is what… (as per below). Response: [Worked with the Bright Ideas Tarot for this session, card picture not included] Taurus! Money! The Earth! Working together to build something that is made out of non-lasting substance. Working diligently to use resources of the earth to make something more fantastic. Analysis: This card is ruled by Taurus. Taurus is about financial stability, growth, the finer things in life, security. The suggestion of this card is that natural resources will be discussed in the news. There is likely talk about money and how the world will work together to grow it; however, it might be artificially grown as mentioned above. Advice, Action, or Suggestion: Check the news out tomorrow. Update: Could this be part of it? News about meeting regarding oil sands (natural resources of Alberta) between Canada and the United States. The major discussion points for the meeting include North American competitiveness (including job creation, efficient borders and energy integration), as well as citizen security (addressing organized crime and cyber security) and sewing stronger ties throughout the Americas. Question: What will the financial situation be on November 11, 2011? Response: [Worked with the Bright Ideas Tarot for this session, card picture not included] Mercury Cancer. Speaking about celebrating, family, getting gifts, togetherness, tribe. Analysis: I get a sense that Canada and the United States will be working together — that many countries will work together to use each other’s assets to strengthen the world economy. Togetherness is a big theme for this day — communicating working together. So there’s a bit of a celebratory nature to the day. Advice, Action, or Suggestion: Check the news out tomorrow. Update: Same as above?! Response: [Worked with the Bright Ideas Tarot for this session, card picture not included] Perhaps there will be a presidential / prime minister address about an economy which needs to transform. Taking one step at a time so the top can be reached. Carrying the weight of the world. Analysis: Here again, the economy and money comes up. An old way, old tradition needs to end. A new economy, and world financial view is being ushered in.